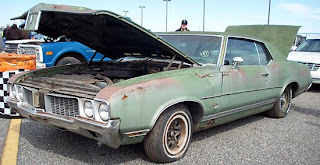 This rare 1970 Oldsmobile Cutlass Supreme SX sold for chump change at a recent classic car auction (auction story here). I know about the recession and massive job losses. 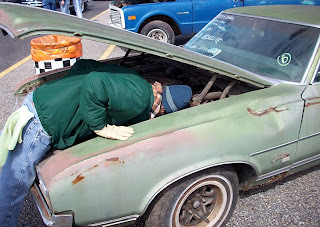 But the $600, no reserve bid was a steal for a car packing its original 455 cubic inch W-32 power plant. 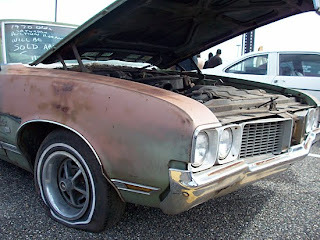 For 1970 models the W-32 Oldsmobile engine provided 365-horsepower and 500-lbs.ft of torque. 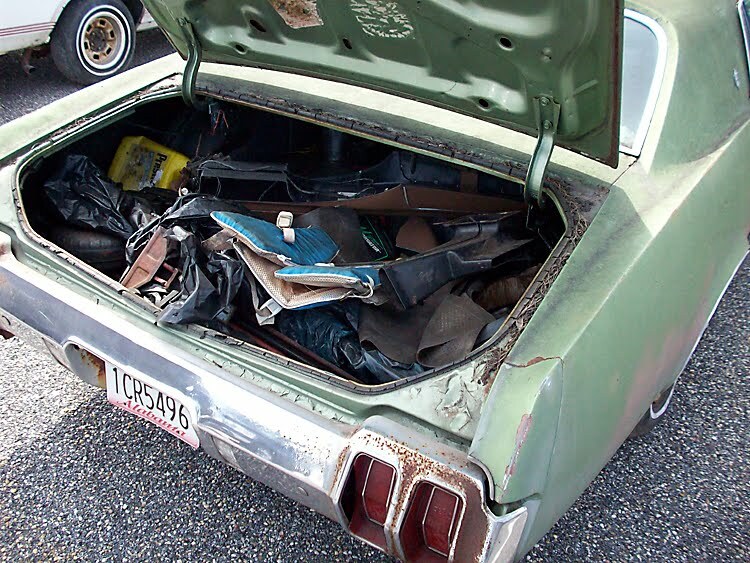 The pitiful, inoperable condition of the Olds was partly to blame for the lack of attention it received. One lucky, low dough bidder was rewarded for the overall Olds SX ignorance. The new owner towed away one of Oldsmobile’s rarest, most powerful musclecars. I was green with envy. 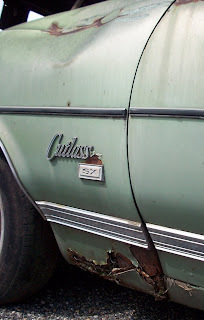 Recently I discovered how rare Olds SXs were when I saw one in my neighborhood. 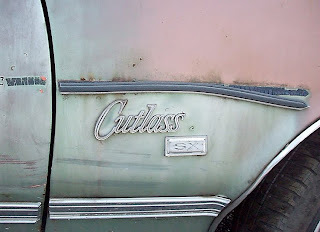 I thought it was JUST a Cutlass Supreme. 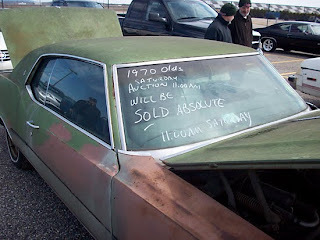 The owner quickly let me know that his ’71 Olds SX was more rare than a 1970 Pontiac GTO Judge. He just happens to own a ’70 Judge and a ’71 SX, so he should know. He also revealed why the stealthy Olds SX was developed – as a way to avoid high insurance premiums. Giving customers a Superman engine in Clark Kent’s clothing. I was hooked. My SX sensors were tuned-in and immediately I knew I missed a deal when I saw the bruised, sagging, SX hulk moments after it sold. 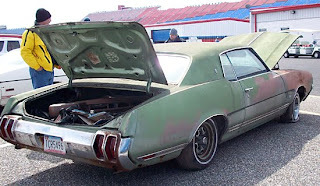 Generally, Buicks and Oldsmobiles get zero respect when you combine a need for complete restoration and this minty shade of green. Few know about the Cutlass Supreme SX legend and SX owner Bob Peters is trying to change that. His website SX455.com is collecting a database of SX owners. Peters estimates that 1,025 SXs were built in 1970 with the W-32 engine. Prices on these low production SXs promise to climb. As word spreads and people realize what they passed up at this auction the SX bug may bite. You’ve been warned. 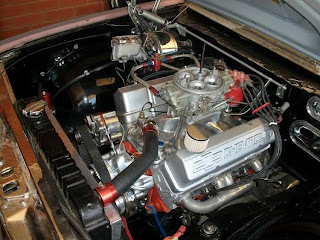 The W-32 (365-horsepower) was the king of the 455 Olds engines in 1970 although L-31 (365-horsepower) and L-33 engines (320-horsepower) were available. 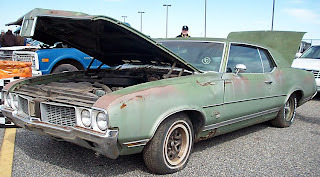 According to this Olds 455 site, a total of 6,404 SX coupes, 793 convertibles were built in 1970. 1,820 SX coupes, 357 convertibles were built in 1971. 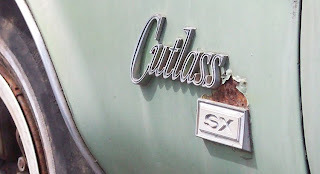 Odds are you won’t find another $600 Cutlass SX this week but good luck trying anyway. Yep, that’s the original carburetor! Is that patina real? Does is matter? 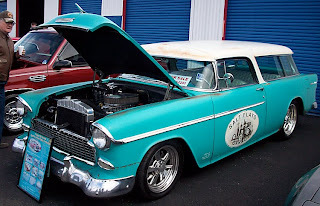 1955 Chevy afficionado, Paul Jones of Trussville, Alabama wanted a vintage patina look applied to his frame-off restored 1955 Chevrolet Bel Air Nomad. 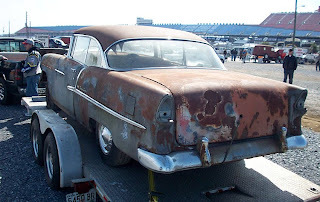 Jones likes ‘old stuff to look old.’ He bought this rare 1955 Bel Air Nomad out of Arizona. The car had been in storage for 15 years. It endured another 4 years in Alabama before Jones got ready ‘to do something with it.’ That something became a modern interpretation of a daily driven Bel Air Nomad. Now that’s something you don’t see everyday at WalMart. 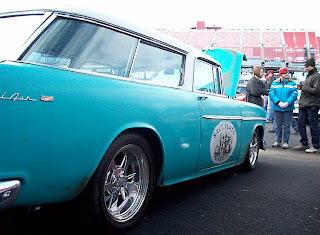 His patina perfect Nomad looks convincing enough to fool the “old school” hot rod crowd of its authenticity. All the chrome and stainless steel pieces are almost perfect. Red oxide primer peeks through the Nomad’s carefully-crafted worn paint. 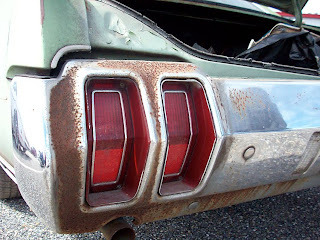 Faux patina is evident on the rounded edge of the bulging hood and along the top of the quarterpanels and tailgate door. These high traffic spots where hands would have rubbed in years of love and slowly erased the Sea-Mist Green paint surround the car. 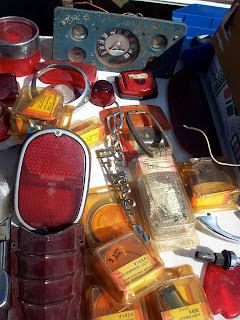 Call it junkyard chic. Maybe it was Gray Baskerville of ‘Hot Rod’ magazine fame and his 1932 Ford Roadster that first made primer look so fine. 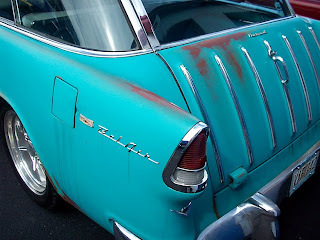 There was a time when battered, scarred paint was sanded down, smoothed, masked off and covered with a new coat of paint. Shudder the thought. 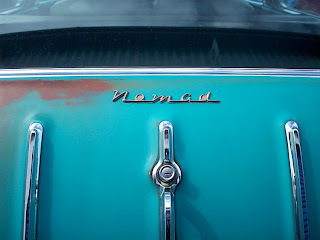 Jones’ Nomad wears the faux worn paint as a badge of honor. A tribute to all the road warriors who eat, sleep and breathe cars. Jones is not a late comer to the hot rod scene. He put the miles in banging gears and turning wrenches years ago. Jones built the Nomad in memory of two of his old racing buddies, Jerry “Bud” Vann and Dwight Schultz. 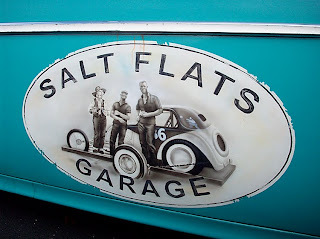 Their likenesses adorn the mock ‘Salt Flats Garage’ sign painted on each door. Also pictured on the sign is whiskey-maker, Grandpa Jones. The rust and patina aging effects were created by artist Tommy Brock of Wild Side Paint & Airbrush of Albertville, Alabama. Street Scene Automotive in Trussville, Alabama did the heavy lifting of building Jones’ frame-off Nomad. The 1955 Bel Air Nomad with a total of at 8,386 built, had the lowest total production of any Chevrolet passenger vehicle in 1955. That is less that half of one percent of the total 1,736,723 Chevrolets built in 1955, as reported by 55classicchevy.com. 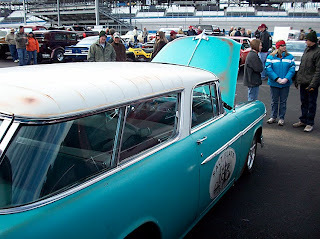 Chevrolet built the two door station wagons in more plentiful and cheaper models – Two-Ten and One-Ten Handyman models. Jones is not afraid to take his Nomad on the road. Road trips to Pigeon Forge, Tennessee and Georgia have allowed Jones to stretch the legs of the Nomad’s high performance small-block engine. 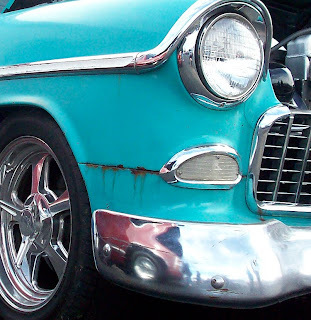 Paint chips and on-road battle scars are not noticed or frowned upon. 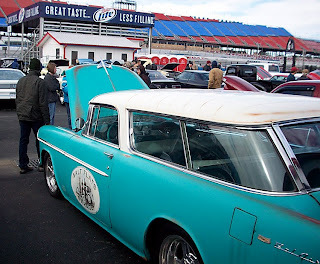 Jones’ Bel Air Nomad draws a crowd wherever it goes. That’s not a bad thing. Considering he recently decided to sell it. But don’t let the faux rust fool you. Jones doesn’t plan to sell it for a project car price. A stack of bills totaling $61,000 will get this old Nomad into your garage. 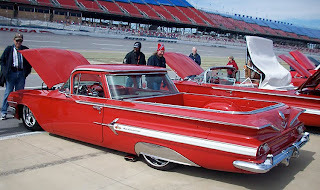 Got a cool car or car story? Share it with junkyardlife. Send them here. See more rusty relics here. 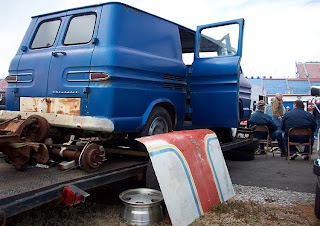 A trip to the junkyard may reveal a peak at hot rod history. I ran across this Magster wheel on a recent parts pulling adventure. In the 1950s magnesium alloy rims, a.k.a. mag wheels, hit the market. They were intended to save weight and help drag racers go faster. Guys without the know-how or cash to make their car fast, still wanted to look fast. 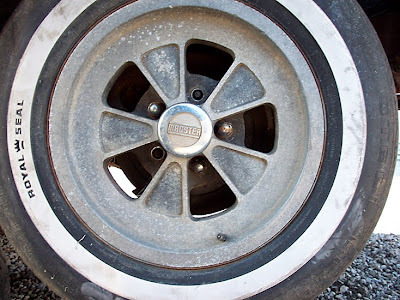 The cheapest way to do that – bolt on a set of mag wheels. A trend was born. Dozens of mag wheels designs have been launched over the years. Halibrand, Torq-Thrust, Cragar S/S, Slot, and E-T are a few of the brands and types of mags which have reached mass appeal. Fast forward 50 years and quality vintage Halibrands fetch $500 or more, each. I knew the curb appeal of this Magster wheel was lacking. It definitely exuded a 1960s vibe, could it bring Halibrand bucks? I didn’t buy it. I would like to blame the wide whitewall tire for taking a bit of the charm away. So, what did I miss out on and where does that leave our lonely Magster? I don’t know anything about the origins or even if the center cap was telling the truth. 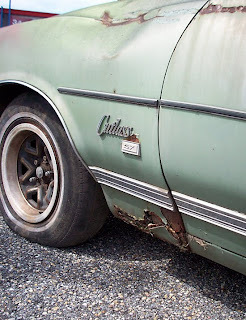 The wheel was bolted to a 1975 Buick Century. A battered land yacht waiting for the crusher. Should I have saved it? What was it worth? I should have pulled the rim off and photographed the back of the wheel as well. One photo is all I have. 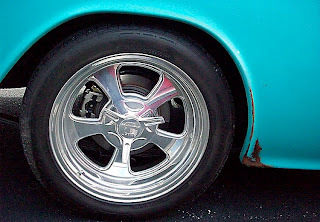 If you know anything about these rims, leave a comment or send me an email at junkyardlife. Three days of showing and selling classic cars and parts attracted more visitors than ever before to the relocated Alabama Antique & Classic Car Auction, Car Corral & Swap Meet, organizer says. Inclement weather played a factor in low attendance on Friday. Chapman said that cool temperatures and strong winds gave organizers a “tough time, especially setting up on Thursday.” On Friday, Talladega Superspeedway offered rides around the track in a Pace Car to winners whose ticket numbers were pulled from a hat. Saturday was the busiest day of the event. 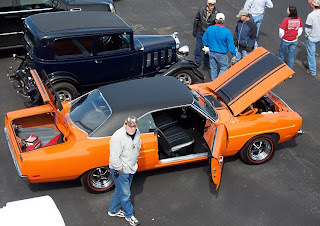 The auto auction and car show, were featured attractions Saturday along with warmer temperatures. 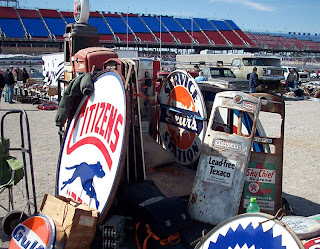 Automobile tags from as far away as Oklahoma and Missouri were spotted in the spectator parking lot near Turn 2 of Talladega’s infield on Saturday. 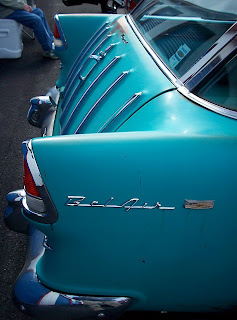 More than fifty classic cars were on display that weren’t for sale or auction. 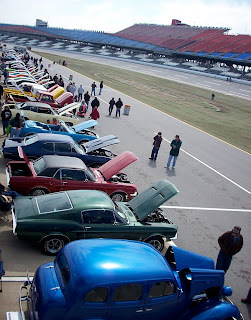 The Dixie Vintage Auto Club hosted an Antique & Classic Car Show on Talladega’s pit road. 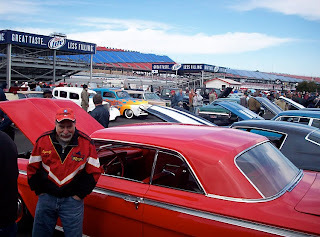 Gary Adams, vice president of the club, was hopeful that more cars would have attended. Rain clouds likely played a role in keeping the show field numbers down. “Our hope is that it will grow into a huge event for our state that will rival the Charlotte Auto Fair and other similar events,” said Adams. Spectators viewed a wide range of show vehicles. 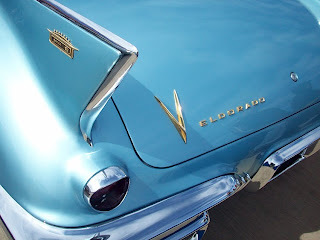 From Packards to Plymouth Road Runners, there was something for everyone. The chance to lounge in the tri-oval grass and climb the track’s steep banking attracted a few wandering car nuts as well. The last day of the event may have been the best day to get a deal. Vendors and car sellers were ready to let go of their wares. “Sunday was teardown day. 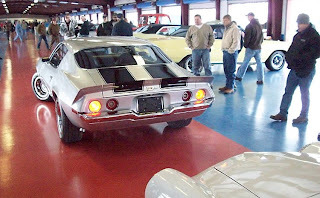 A lot of deals were made in the car corral and swap meet area.,” said Chapman. Some cars that didn’t make the minimum bid at auction were sold to buyers who weren’t ready to go home empty handed. Vendors also found their bottom price on items they didn’t want to haul home. “I know of a few deals or trades that were made the week after the show too,” offered Chapman. Keep that in mind. You might want to grab the phone number off that hot rod you can’t afford today. It might be cheaper tomorrow. The task of moving and reshaping the 30-year-old event from the Birmingham Fairgrounds to the infield of Talladega Superspeedway was a challenge. Chapman is optimistic about the future. He wants this event to be a must-see for the southeast. “I have spoken to track officials and we will be back next year,” Chapman says. He is also exploring the idea of including a NASCAR-type driving/ride-along activity to give event-goers more to see and do at the track. Did you go to this event? Post a comment below or shoot me an email here. 1957 Cadillac Eldorado in the Dixie Vintage car show. 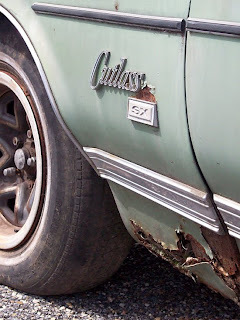 This 1970 Oldsmobile Cutlass SX sold for a few hundred bucks. 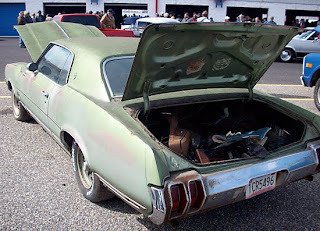 Australia’s John Sutton sent junkyardlife photos from a recent All Chrysler car show in Adelaide. 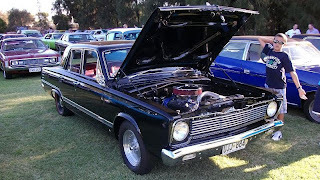 The 2010 All Chrysler Day celebrated its twentieth anniversary in Southern Australia and forty years of the Chrysler’s VG Valiant. 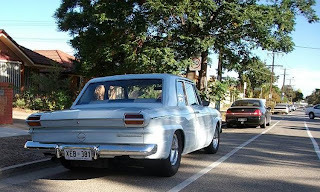 Australian Mopar fans were treated to the Mega Cruise that included motoring by Chrysler Australia assembly plants. 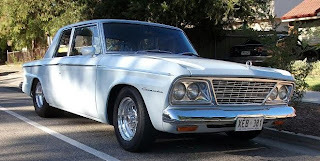 Chrysler created a loyal following with automotive enthusiasts in Australia with the debut of the Hemi-6 engine in 1970. The Hemi name, made famous in the U.S., carried huge marketing appeal. 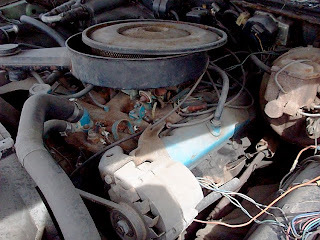 These inline six cylinder engines solidified Chrysler’s reputation from 1970 to 1981. 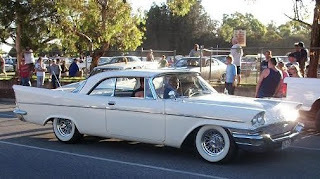 Hundreds of great Mopars turned out for Australia’s largest Chrylsler car show. Enjoy the photos from down under. Send your photos and stories here. 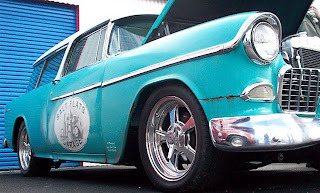 See more Australian hot rods here. Read about a 1970 Plymouth Road Runner here. Wrenching on old cars, attending swap meets and car shows are all part of living a junkyardlife. This holds true no matter what part of the world you live in. John Sutton of Adelaide, Australia is more than 15,000 miles away from my hometown of Birmingham, Alabama in the U.S. but we enjoy our passion for all things automotive by doing the same things. 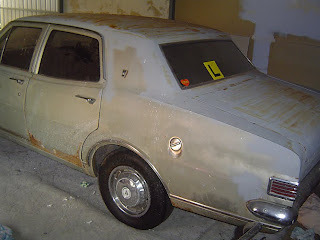 Sutton sent us photos of two of his car projects, a 1970 Holden HG (above) and a 1968 Holden HK Premier. “I live about 15 minutes from the Holden factory in Adelaide,” said Sutton. 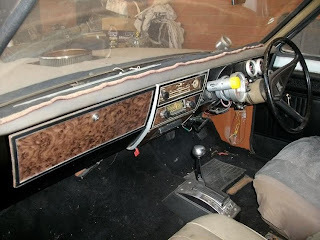 “I can’t wait to start rebuilding my HK and giving it a new lease on life.” Sutton emailed these photos just before he left to attend two car shows in Adelaide. More hot rod photos from Australia are on the way. Life is good. 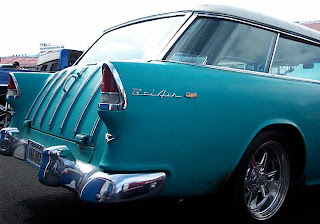 For those unfamiliar with Holden products you may know more than you think. General Motors has owned GM-Holden Ltd. since 1931. 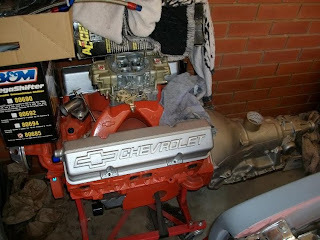 Chevrolet 350 cubic-inch, small-block engines have been produced in Holden vehicles in Australia since the 1960s. 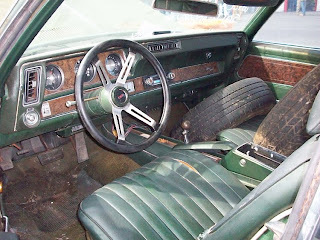 Sutton’s primered 1970 Holden HG is equipped with a GM V8 (right), Weld wheels and a host of speed parts. 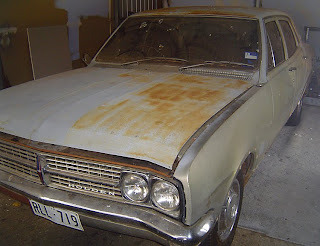 Future plans include installing a fresh V8 painted Chevrolet orange into Sutton’s silver 1968 Holden HK Premier. Sutton thinks this may be the year to score a vintage American-made hot rod. “Hopefully this year some American iron will land in my driveway. A Camaro or 1955 Chevy?” Australia has a surprising amount of Fords, Chevys and Chryslers to choose from. 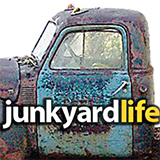 Send your Junkyardlife stories and pics here. Fresh V8 ready to install in the 1968 Holden HK Premier. 1970 Holden HG Premier, it’s right-hand drive in Australia.